Dupont Circle is located in northwest Washington, DC, north of Downtown, east of Rock Creek Park, south of Adams Morgan and Kalorama, and west of Logan Circle. The circle itself is a traffic circle and a park with a large fountain, walking paths and green space. 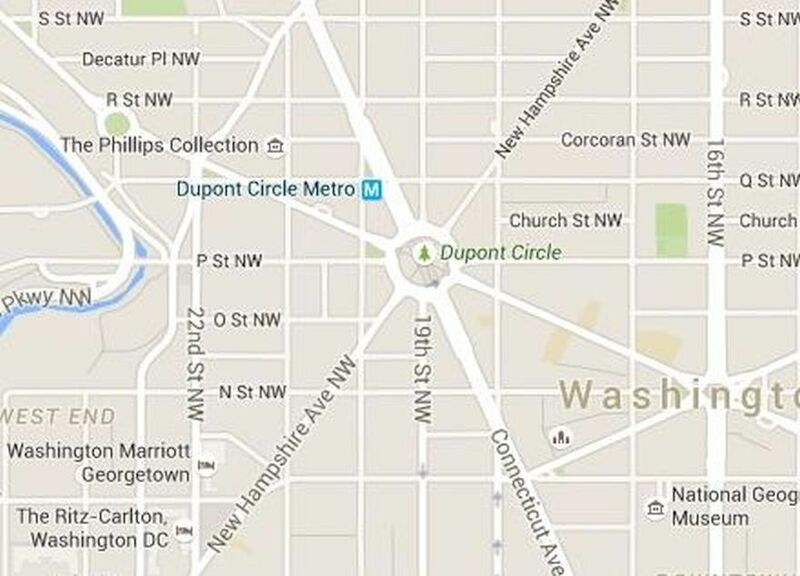 The major roads that surround Dupont Circle include Connecticut Avenue, New Hampshire Avenue and Massachusetts Avenue. The Metro station is located just north of the circle. The area is a popular destination for nightlife, sightseeing and shopping. Read more about Dupont Circle. The Dupont Circle area is very busy and parking is limited. Public transportation is highly recommended. There is some street parking available though spaces are hard to find on the weekends and during the peak tourist season. From the North:Take I-495 West to Silver Spring, Take Exit 33 Connecticut Avenue South, Route 185, Continue on Connecticut Avenue for 8 miles. From the South: Take 1-395 North to US 1 to the 14th Street Bridge. Continue to Thomas Circle, stay in the middle lane and continue to Dupont Circle. Colonial Parking - 1919 Massachusetts Ave NW, 1495 New Hampshire Ave NW, and 1333 New Hampshire Ave NW, Washington, DC (202) 295-8100. Central Parking - 11 Dupont Cir NW and 1800 Massachussets Ave NW, Washington, DC (877) 717-0004. InterPark - 1325 18th St NW, Washington, DC (202) 223-3263. Dupont Circle is one of Washington DC's most popular neighborhoods and a great destination for nightlife, sightseeing and shopping. This map shows where Dupont Circle is located in relation to downtown and the major tourist attractions in Washington DC. The neighborhood is located 1.5 miles north of the White House and 2 miles north of the National Mall. Nearby neighborhoods include Adams Morgan, U-Street, Shaw, Logan Circle and West End.